The course at Nags Head Golf Links was designed to delight players of all abilities. In addition to offering remarkable views, its idyllic setting along the banks of the historic Roanoke Sound provides a temperate climate, which yields outstanding course conditions year-round. When many people refer to the Outer Banks, they use the term "Nags Head" to generically describe the area. The truth of the matter is that Nags Head was first a physical location on a map, then a township and, finally, the most recognizable of all the northern Outer Banks vacation destinations. Please call 252-441-8073 for current rates. Call 252-441-8073 for rates and tee times. Contact Nags Head Golf Links at 252-441-8073 for more information and details on holding a golf outing at the course. Don't worry about finding locations for Nags Head weddings. If you're looking to have a beautiful Outer Banks wedding, the Nags Head Golf Links is the perfect location for your special day. Our spectacular venue is located in Nags Head, North Carolina on the beautiful and picturesque Roanoke Sound. 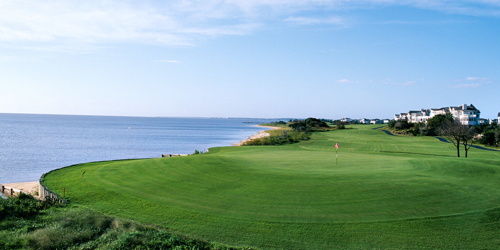 With stunning panoramic sunset views over the sound, Nags Head Golf Links is a photographer's paradise. It's the ideal setting for a romantic destination wedding and reception. The Club has an on-site caterer and a helpful experienced staff. Let our professional event planners make your special event into a dreamy reality. Contact Nags Head Golf Links at 252-441-8073. Contact Nags Head Golf Links at 252-441-8073 for onsite or nearby dining options. This profile was last updated on 05/09/2017 and has been viewed 7,811 times.